After 35 years of services to the poultry industry we feel that we are some of the best and leading consultants in the poultry business. Our activities took us to more than 115 countries spread out over the world, where services are covering each field of the sector from Grand Parent Stock farms to the Packed End product in hand,from an idea to the product in hand we assist in each step in between these two points. Our dedicated team of experts can handle most if not all problems of the poultry sector and animal feed industry. All of them have a proven track record and are expert in their own field of specialisation. Usually our cost is recouped in a short period for what concern actions in existing operations. Where for new investments we deliver a project within budget, within the time allocated and with a technology and project structure which will allow the most efficient production possible. Our customers and to there advantage are making use of this diversity in expertise and know-how and are happy to work with us. In a business environment where each decision has its impact on the future of the company our assistance can helps in taking well motivated and calculated decisions, decision based on solid data and information. If you have some ideas about new plans or you face some problems than please let us know we will be happy to offer you our approach how to go forward. 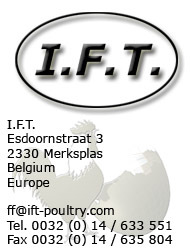 Please visit our website at http://www.ift-poultry.com where you find all information subject to our services.